If I’ve learned anything over the course of running a blog with Bob, it’s that I love dessert. I love making it more than I love eating it, but that’s besides the point. Sometimes when I’m planning I’ll even plan backwards. As in, if we have Chocolate Hazelnut Tart, will we want a nice, light dinner so we can have more tart… So far, we’ve had good results! Our dinner guests didn’t have a speck left on their plates, and that must mean something! 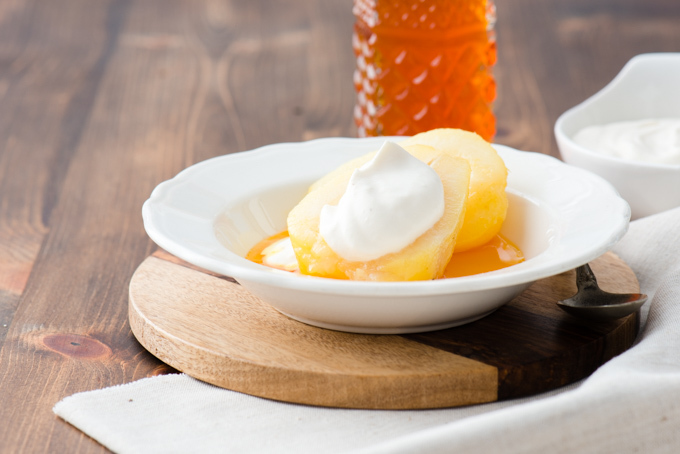 A light, simple dessert with a mildly sweet syrup to finish. Gently crush cardamom with a rolling pin to slightly crack open pods without releasing seeds. Combine cardamom, wine, sugar, lemon juice, saffron, and salt in a medium saucepan over medium heat, stirring until sugar dissolves. Add pears, and add water if needed until pears are completely submerged. Cover with lid slightly ajar and simmer, turning occasionally until pears and tender but not mushy, about 30 minutes. Using a slotted spoon, transfer pears to a plate. Increase heat and boil poaching liquid until reduced to a cup, 10-15 minutes. Meanwhile, strain heavy cream through a fine mesh sieve, or cheesecloth. Whip cream until soft peaks form, add lemon juice to taste. 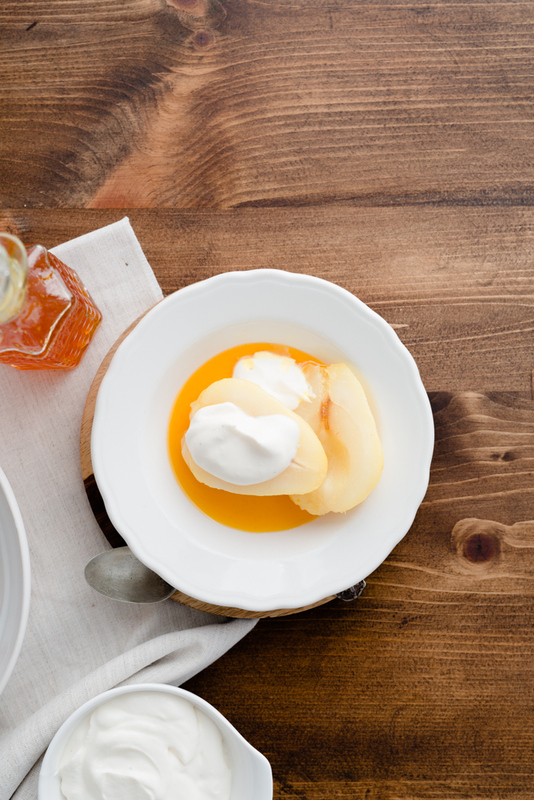 Spoon syrup over cold or room temperature pears, serve with a dollop of whip cream.